The Fourth of July is this coming Tuesday. It’s America’s biggest party and we love to celebrate with fireworks. Making a good fireworks picture is satisfying and difficult. So here are two tips for making great fireworks photos. Use a tripod for this technique. It doesn’t have to be fancy. I used the Platypod Ultra with a Vanguard TBH-50 head for all the pictures in this post. Try those settings (f/8, 3 Seconds, ISO 400) and you can’t go wrong. To adjust how bright the fireworks streams are, change the aperture. A smaller aperture, like f/11, will make the fireworks darker, f/5.6 will make them brighter. f/8 is a good starting point. If you make them too bright, you’ll lose color intensity. If you want to adjust how long the streams are, change the shutter speed. Longer speeds, like 5 seconds, will make longer trails, but it will also make bunches of bursts brighter. That is to say, when many rockets go up at the same time, a longer shutter speed will record all those launches and they will be recorded on top of each other and you’ll end up with a really bright spot where they overlap, as in this picture. If you want to lift the brightness of the whole picture, you can turn up the ISO. Don’t be shy about it, either. High ISO is your friend, and I doubt you’ll need to go above 1600. If you raise the ISO, you may want to close the aperture a little more to darken the streams of sparks back to where they were. Please remember: you’re shooting a black sky and un-lit foreground at nighttime. It’s supposed to be dark. This picture will look mostly black with highlights of fireworks. Your histogram will look terrible, like a U with an empty center. It’s fine. It’s nighttime. A time-lapse video speeds up time and shows change very quickly. In this case, you should just shoot the frames for a time-lapse, not a video. Many Nikons have this ability, but you should choose Interval Shooting, not Timelapse (this setting makes the video only). All Lumix cameras can shoot a time-lapse sequence and leave you with all the individual pictures, and your camera may have a built-in intervalometer, too. Set your interval to the minimum, which is usually 1 second. That means it will take pictures with a 1-second space between frames. Set the number of shots to something very high, like 9999 so that you don’t have to worry about it stopping in the middle of the show. If you don’t have a built-in setting, you can buy and external intervalometer to control your camera and make pictures over time. You can buy an expensive branded one or an inexpensive off-brand tool. I’d go with the off-brand tool, just make sure you buy the one designed to mate with your camera model so it’s got the right kind of plug. The benefit to using an intervalometer to shoot a time-lapse sequence is that you won’t miss any shots and you can just sit back and enjoy the show with your friends and family while your camera is working away making great pictures. To get setup, just frame your shot how you like. If it’s already dark outside, you can turn the ISO up as high as possible and make a picture at a faster shutter speed, like 1/20th of a second, to see what your composition looks like. Once you’ve got the correct framing, drop the settings back down to f/8, 3 seconds, ISO 400. You’ll need to switch to manual focus so the camera doesn’t have trouble hunting for focus while shooting your interval. First, use autofocus to focus on something about the same distance away as the fireworks will be. If it’s dark, use the center-most focus point and focus on a light source. You’ll be making a lot of pictures, so be sure to format your memory card before starting. Try to use a fast card, too. If your card is too slow, the camera won’t be able to record more pictures until some are written to the card and you’ll miss a few pictures here and there. Now just start the interval and enjoy the show. Best of all, you can use the pictures to make a time-lapse video if you like. 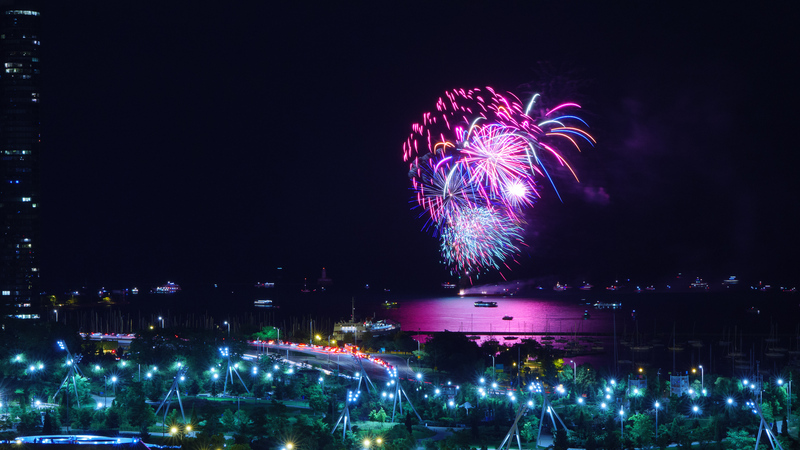 These simple exposure settings will give you good basic results for shooting fireworks. Use an intervalometer to let the camera work automatically and you can enjoy the show and make fun pictures at the same time. I can’t wait to see your results. Great starting guide! I like the idea of using the intervalometer so you can relax and enjoy the show!